Thanks again to Jon C who has been on his travels. He spotted this sign in Peterborough outside a Chinese takeaway. As he says, where do you start? Well, let's deal with with the most obvious first. List of prices, yes. Prices list (or List with a capital L, even), no. Unless it means that the prices lean one way from Monday to Wednesday and then another from Thursday to Sunday. If that's the case then it's quite clever. Someone's obviously told them there should be an accent somewhere. Not there though. And I'm not very comfortable with the capitals either. Why the capitals? And where's the capital P for Pacific? Unless this RIM, whatever it may be, is actually peaceful in character. There's plenty of room for the full word. dim sum, surely. Unless the light from our life-giving orb is fading. Also, two words, please. No hyphen necessary. And, again, why the capitals? Meaning a Japanese lunch box, or, indeed, a Japanese lunch. Close to Chinese, but no cigar. 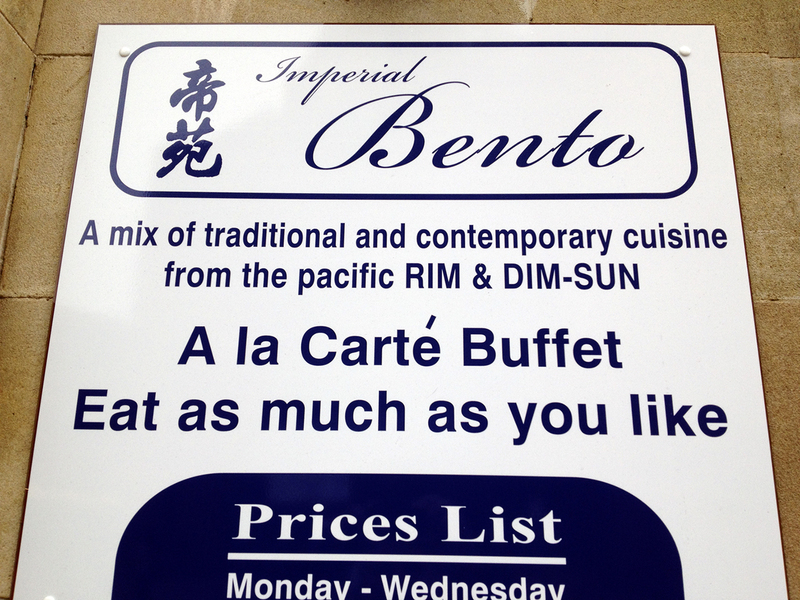 Finally, on a typographical note, the script typeface used for the words Imperial and Bento. That's it. The one that's supposed to look like joined up writing.